Let me ‘set my stall out’. I believe that there are too many people on the planet, and that the level of human population cannot be sustained. I wonder if a widespread transition to a vegan diet could be the solution to this problem….. This was how this post was originally supposed to start (and it was to be called “Go vegan, save the planet”), with the plan that I would then attempt to take apart the various health arguments for being vegan that one reads. This would lead to the conclusion that ‘veganism’ is yet another of Mother Nature’s schemes for reducing our species, because it’s a lifestyle that weakens and eventually kills us. If it kills enough of us that would be great for the planet. Having begun to set about ‘The China Study’ I started to feel demoralised. I’m not sure that science is a very good tool for challenging the notion that a vegan diet is healthy, not least because much of the internet based information on ‘healthy vegan diet’ relies on repeating fallacies, rather than providing evidence. I had also been listening to an episode of “The Evolving Scientist” podcast, discussing the compatibility of science and religion, which inevitably contained a discussion of the nature of faith. I suspect that any of us who follow a particular nutritional dogma are in danger of relying on faith rather than evidence (perhaps more of this in a coming post…) and this certainly seems true of the vegan presence on the web. It would appear that the popularity of a vegan diet is on the rise – a 2007 government survey suggests that people describing themselves as vegan number more than one million in the UK. Cornell McClellan, President Obama’s trainer and a member of the President’s Council on Fitness, Sports & Nutrition is a vegan advocate. A number of public figures in the USA have proclaimed their veganism in the last few years – Ellen Degeneres’ ‘Going Vegan with Ellen’ website has a catalogue of celebrities who are vegan, including Bill Clinton. Even when you set aside the ethical concerns, you don’t have to look hard to see why it would be a good idea to become vegan, the ‘facts’ are widely available on the internet. I’ve begun to wonder if there might be any mileage in luring people away from veganism not by arguing against the moral/ethical stand point but by asking why it’s being so widely promoted, and who stands to gain from it. I’m interested in promoting a paleo/primal way of eating to my family, friends and clients. One of the wonderful things about this way of eating is that, in essence, it involves buying fresh ingredients, cooking, and eating them. To borrow from Frank Forencich it involves eating food rather than food products. Luckily my local butcher sells vegetables, so I can go there and buy steak, eggs, peppers and kale, do some washing and chopping, fry and eat – PERFECT. The key point is that none of this food has been processed or packaged, no-one has ‘added value’ by dressing it up in any way, it hasn’t gone near a factory (The Ginger Pig rears their meat on their own farm), and there’s probably a relatively small margin of profit, that won’t be going to shareholders. There may well be some vegans that eat in a similar way to the one described above (sans steak and eggs), perhaps even growing their own vegetables, but we know deep down that they aren’t going to be very healthy without more than kale and peppers. 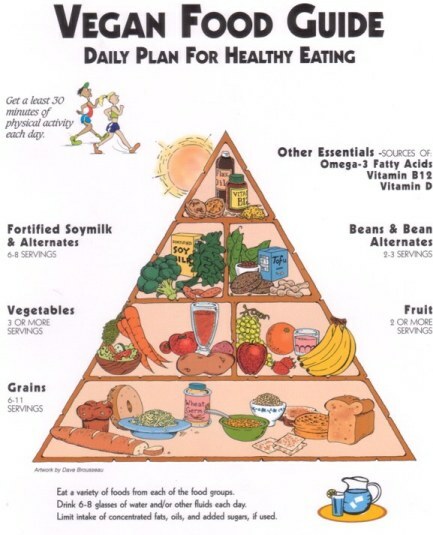 Note that the pyramid is heavy on the carbohydrates, easy on the protein, and very light on fat. Leaving aside the topsy-turvey nature of this picture (the one non-essential macronutrient makes up the bulk of daily food intake), this pyramid will render the follower heavily dependant on agriculture. Hats off to those vegans that manage to get all their carbohydrates from local or small-scale producers. The grim reality is that much of the world’s grain output is controlled by a few giant food producing corporations and those “healthy whole grains”, as well as having to undergo significant processing, are likely to be lining the pockets of companies like Cargill (their own figures show 2011 revenues in excess of $119 billion). Cargill is a privately owned business, and known for secrecy – according to Wikipedia, in addition to having a huge share of the market of grain for human consumption, they are a major supplier of meat to the US market, the largest chicken ‘producer’ in Thailand, and handle the entire egg production for McDonalds in the US. Money aside for a moment, Lierre Keith does a stellar job of exposing the horrible realities of agribusiness in The Vegetarian Myth: degradation of farmland, insane subsidies, bankrupting of farmers in developing countries etc. Moving higher up the pyramid we have the bean department. I love the idea of ‘bean alternates’ – what could that mean? Another vegan pyramid includes the fascinating “meat analogs” (analog meat! Did anything ever sound less like food?) – perhaps bean alternates is another way of saying bean analogs? Star of the bean and, of course, soy department – the soy bean. Which corporation is one of the world’s largest producers of soy bean seed, and mired in controversy? Monsanto – I’m not linking because I want to promote them – have a look at the website and consider that this company’s business is FOOD. They have a ‘portfolio’ of soy bean seeds, including some that are engineered to poison insects. Frankenstein’s monster anyone? Good for the environment? According to the Guardian soy is in 60% of the UKs processed consumer foods, often in the form of soybean oil. You can easily research the thyroid inhibiting properties of soy, not to mention the problems with partially-hydrogenated vegetable oils. That aside, why should soy be in so much of our food? Because someone is making a great deal of money from it. While we know that there is no such thing as an essential carbohydrate (useful if exercising above a certain intensity, yes; essential for life, no), protein is essential. Herein lies the challenge for vegans – the great majority of allowable proteins require significant processing. Tofu, seitan, textured vegetable protein – all those meat analogs – have been manufactured. To highlight the point of manufacture I can’t resist including this paragraph about difficulties in soy milk production: ‘With some methods, the problem flavor is controlled, but the product yield goes down. With others the result is good flavor but poor “mouthfeel” , or unsuitable functionality for other derivative foods. Finally, many major processors design either hybrids or variations of these methods, with or without their own innovations. For some consumer products, the final soymilk is “deodorized” with vacuum systems, prior to formulation and packaging.’ (www.soyadairy.com). It seems so counter-intuitive that a vegan diet might be dominated by food products, rather than real food. Again, there may well be many vegans who manage to eat without feeding the industrial complex, but I imagine they’re a small minority. It’s too bad that food has to be a political issue, but it’s unavoidable with the world’s population at the level that it is. People often argue that a paleo diet is too expensive, and it’s true that properly reared animal protein doesn’t come cheap. On the other hand, it’s nutritionally very dense, and the price that you pay is likely a reflection of the real cost of raising the animal, rather than the cost of keeping industrialists and shareholders happy.